NEGRIL, Westmoreland- Three patrons attending a stage show here at the Jungle Nightclub were yesterday morning admitted to the Savanna-la-Mar Hospital in stable condition, and a dozen others treated for minor injuries after being hurt when a canopy they allegedly climbed onto collapsed. 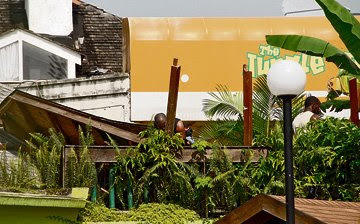 According to Richard Wallace, a director of the nightclub, the incident occurred about 2:30 yesterday morning when the patrons, who had to climb a roof to get to the canopy which covers the walkway to the second floor, were cheering wildly during a performance by Vybz Kartel on the show dubbed 'Jungle Live'. Some female revellers reportedly had to remove their footwear in order to climb the roof to get across to the canopy. Wallace, who expressed regret over the incident, however blamed it on the "very irresponsible behaviour" of the patrons, who are believed to have utilised the fibreglass/shingled covering for a better vantage point. "They had to climb the roof to get across to the canopy and some of the ladies had to take off their shoes to climb onto the roof. They were very irresponsible to climb up on the roof and put themselves in danger," Wallace told the Observer during a telephone interview yesterday. He said that the patrons became abusive towards the security guards and other employees when asked to get off the canopy. One of the female patrons who fell from the collapsed awning reportedly regained consciouness before being placed in ambulance among the other injured who were rushed to hospital. The Negril police, while confirming the incident, said they were unable to provide details as a formal report had not been made up to 4 pm. Meanwhile, the incident did not bring the show to a closure as Elephant Man took the stage after Vybz Kartel.Dancehall legend Beenie Man reportedly performed before incident. Lord if i never know one, just wanna say get well soon to my cousin Adrian, he "says" he was just walking by when he got injured... sure cuz. Anyway glad that it’s not too serious.